TURTLE LAKE – Infinity Retail Services was recognized by the Polk County Economic Development Corporation (PCEDC) for its contributions to economic and community development in Polk County. The 2014 Energy Efficiency Award was presented by Steve Healy, Executive Director of Polk County Economic Development Corporation, during PCEDC’s Business Awards Luncheon at Paradise Landing May 13. . In addition State Senator Shelia Harsdorf presented a Citation by the Legislature on behalf of the Polk County Legislators State Senators Shelia Harsdorf and Robert Jauch and State Representatives Erik Severson and Stephen Smith. Village of Turtle Lake Trustee Ken Mendley presented a resolution adopted by the Village of Turtle Lake Trustees recognizing the company’s achievements. 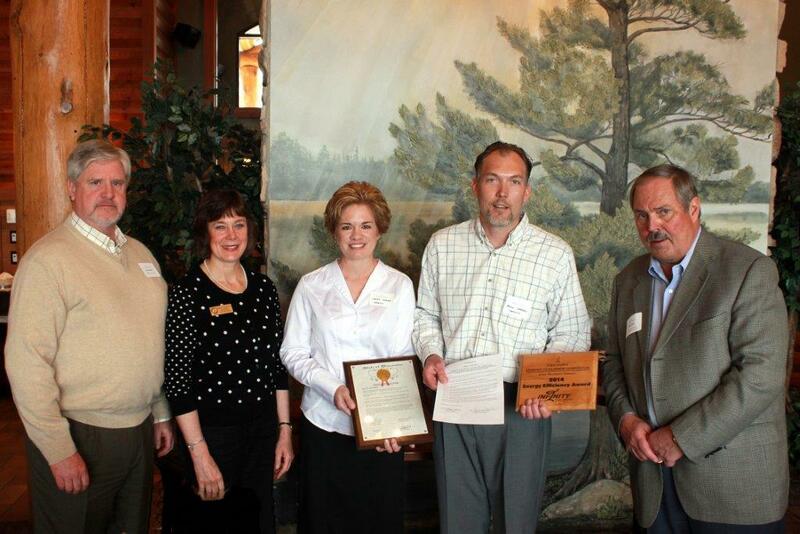 Kevin and Wendy Jansen, founders and owners, accepted the awards and recognition. A 50kw wind turbine currently provides a significant amount of the company’s electrical needs, off-setting more than 100,000 kg of carbon dioxide to date. The facility utilizes motion sensors for lighting not only in the office, but in the shop as well. LED lighting has been installed in all exterior applications, including parking lot, building security, flag and sign areas. A combination of high efficiency furnaces and heat pumps are utilized to heat and cool the office. A newly implemented material handling system allows the company to produce its products more efficiently, decreasing machinery run time and energy use. This also enables greater production in less space due to the elimination of significant forklift traffic lanes. For more information about economic development in Polk County, contact Polk County Economic Development Corporation, 715-646-3369, info@polkcountyedc.com or visit www.polkcountyedc.com. PHOTO CUTLINE: L to R Village of Turtle Lake Trustee Ken Mendley, State Senator Shelia Harsdorf, and Kevin and Wendy Jansen, owners and founders of Infinity Retail Services, and Steve Healy, Executive Director, Polk County EDC.